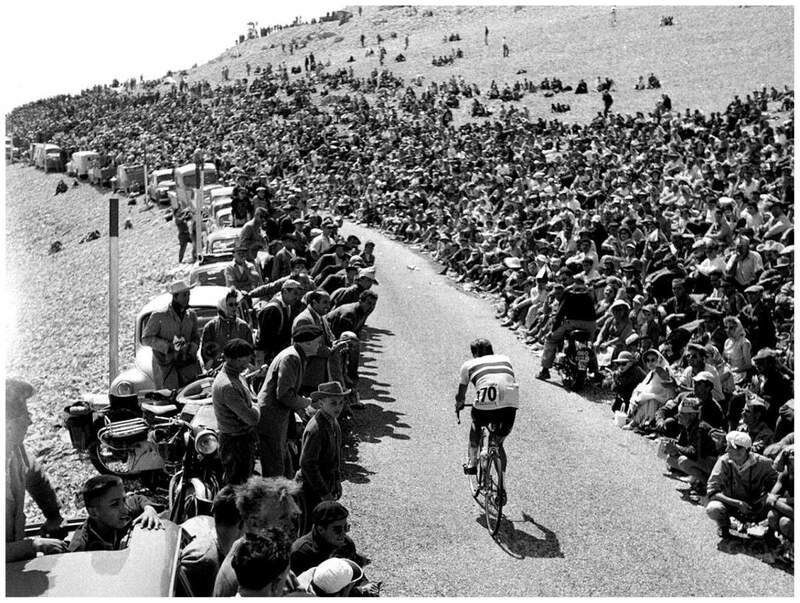 Today’s historic photo of the day: Charly Gaul on Mont Ventoux; Tour de France 1958, stage 18, July 13, Sunday, 21.5 km Individual Time Trial. A 21.5-kilometer individual time trial from Bédouin – up Mount Ventoux. Charly Gaul, as usual, let himself lose some time on the flat stages, always confident that he could make the time up in the mountains. After the Pyrenees he was sitting in eighth place, 10 minutes, 41 seconds behind Favero. He unleashed a wonderful ride, beating Bahamontes by a half-minute. Anquetil finished 4 minutes behind Gaul, Géminiani and Bobet were 5 minutes back. But Géminiani had the Yellow Jersey again. And now, for the first time in his career, Gaul was a true threat to win the Tour de France. The Alps started the next day. Charly Gaul also was victorious at two other individual time trials (stages 8 and 23) and at the mountainous stage 21, and he won the Tour. He earned the nickname of L’Ange de Montange (The Angel of the Mountains) after the 1958 Tour de France, which he won with four stage victories. 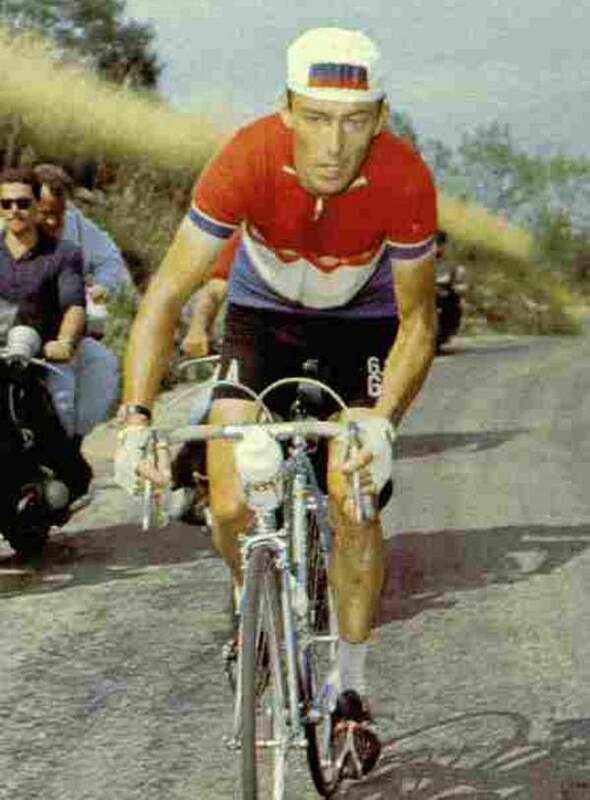 He also won the Giro d’Italia in 1956 and 1959. Gaul rode best in cold, wet weather. In later life he became a recluse and lost much of his memory. Philippe Brunel of the French newspaper, L’Équipe, said: “In the furnace of the 1950s, Gaul seemed to ride not against Bahamontes, Anquetil Adriessens, but against oppressive phantoms, to escape his modest origins, riding the ridges to new horizons, far from the life without surprises which would have been his had he stayed in Luxembourg.” Gaul was weakest on flat stages and in the heat. In the 1957 Tour de France he went home after two days, stricken by the temperature in what Pierre Chany called a “crematorium Tour”. He was at his best in cold and rain, winning the following year’s race after a lone ride through the Alps in a day-long downpour described by the French newspaper, L’Équipe as “diluvian”. It was the first time the Tour had been won by a pure climber.